Many people had been asking about the adorable T-Rex tee since day 1 of wearing it. Here, I’m gonna reveal more about it in details finally! This Tee-Saurus Rawr the T-Rex Tee and some other related merchandise were courtesy of the Tee-Saurus! The Tee-Saurus story is always about facing challenges with a broad smile. We've been through some really rough and unexpeted storms but looking at the world with optimism and knowing there is always light behind the dark cloud kept us going. No matter how difficult a path may be, remember your passion. Remember what you set out to be. Remember nothing can bring you down except yourself. That's why you see graphics that are designed to set a smile on you like our signature Rawr, the cheeky and mischievous T-Rex. Inspired by ideas. We brainstorm and bring you designs that are distinctively like no other. Tee-saurus is all about wearing a lifestyle, not just a tee. You are what you wear. That's precisely why tee-saurus is set out to achieve. We are dedicated to provide different designed apparels that not only look good but it contains a collection of ideas weaved into each series. I’m not usually a t-shirt person, but this tee is really cute and yet fashionable at the same time so I couldn’t say no. Besides, the quality of the material turns out to be better than my expectation for printed tees. It was comfortable and I’m glad that I took one size up so that I can wear it for dance practices as well, other than for casual day-outs. If you’re STILL fretting over what to get for your bae this Valentines’ Day, do consider the Tee-Saurus tees that come in both ladies and men cutting and sizing! M and I wore our ‘couple tees’ to our pre-wedding shoot meeting at the bridal studio, and the staff were all swooning over how endearing it is. Also when he had to travel overseas and I couldn’t go along, there’s the couple tee to make us feel that we’re still close to each other. 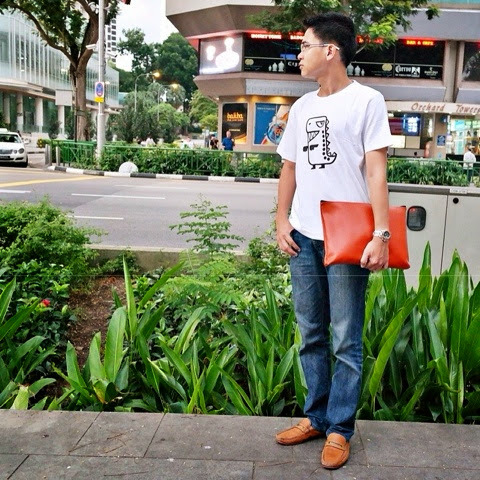 Besides tees, Tee-Saurus also carries many other charming merchandise like totes, sketchbooks and seasonal frames (CNY yay!). 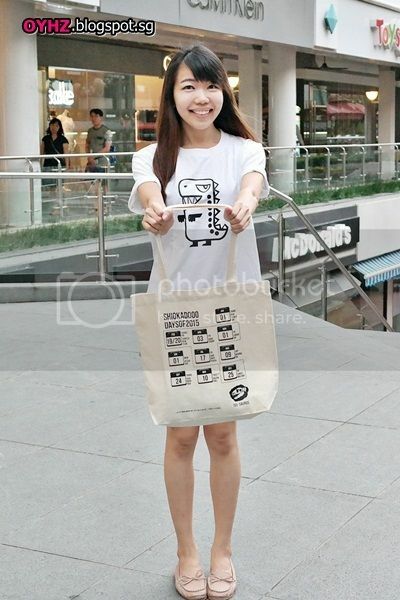 Check out this Tee-Saurus Holiday that serves as a reminder of the long weekends in year 2015. It certainly helped me in planning my holidays this year as I hang the tote on my bag stand and can refer to it easily. No need to waste time filtering through the calendars manually or even googling (though google is my best friend, sometimes it takes longer than required still, bleah). The tote also doubles up well as a hand-carry on the flight, and a spare foldable shopping tote when you go overseas, so convenient! And I wasn’t the only one excited about the frame; I received the frame just before flying off to the United States. 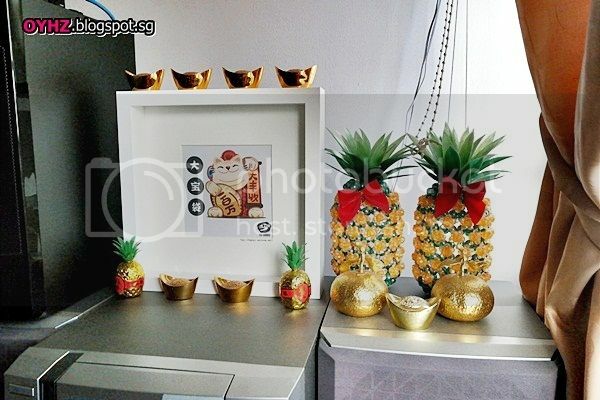 When I got back from the business trip, my mom couldn’t wait and had already began the CNY decoration, kick starting with the fortune cat frame without informing me at all! Lol. Look at how cute it is sitting with the miniature pineapples and yuan baos. Nearest MRT station is Houshanpi station. Take a MRT train to Houshanpi Station and exit by 'Exit 1' - Wufenpu Commercial Zone. From there, (you may wanna use your GPS or phone map apps or simply ask a local) walk north along Jhongpo North Road to the intersection of Jhongpo North Road and Yongji Road. Best to go around late afternoon/evening so that you can simply follow any batches of school students alighting at Houshanpi station. They seem to be mostly going towards Wufenpu. 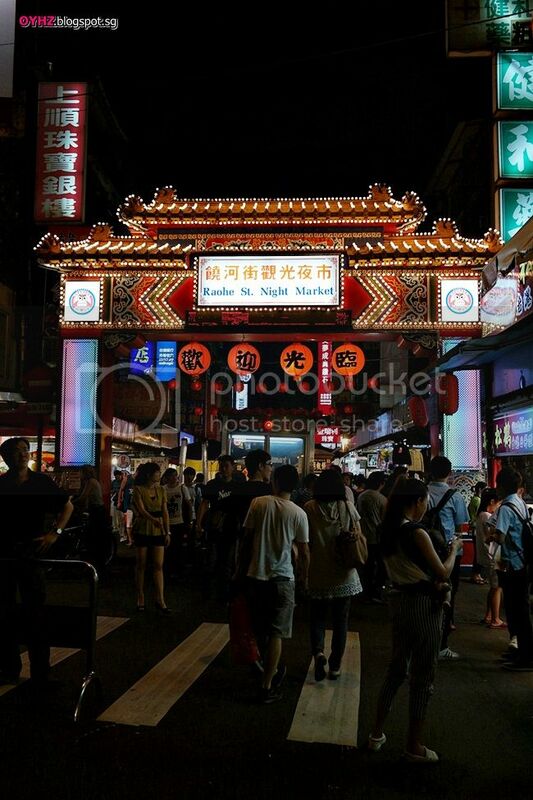 Also, you can shop til evening and hop over to Raohe Night Market nearby! Tip: Try not to visit on a Monday as the day is mainly reserved for wholesalers and thus the store keepers may not have energy to entertain tourists/random buyers. 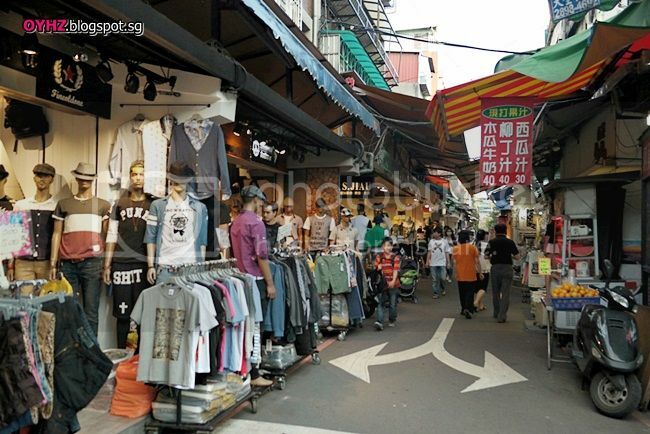 Wufenpu is the largest commercial zone focusing on clothing in Taiwan. 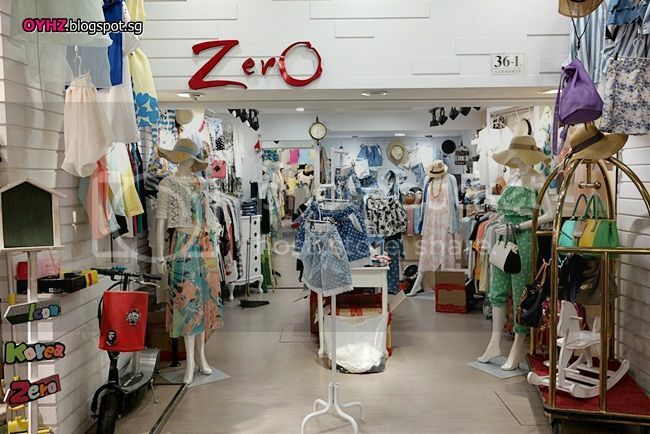 There are around 1,000 shops selling different types of clothes, as well as shoes, bags and jewelry in part of them, in a tiny area close to half of CKS memorial hall in size. Plan a systematic manner of shopping up & down the rows of shops if you intend to comb through each and every one. Otherwise, it'd be so easy to get lost in this shopping maze! Prices are hiked up for buyers to bargain unfortunately. 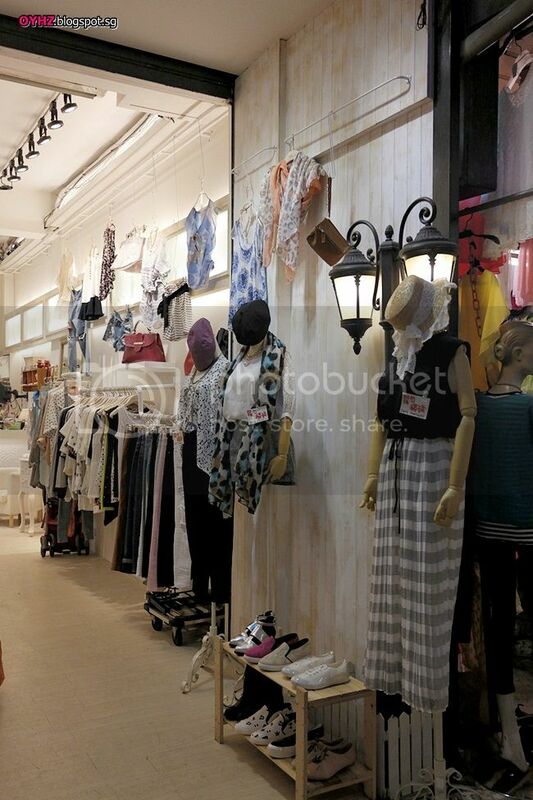 Most of the stores do give a slight discount ("wholesale price") if you buy a minimum of 3 pieces, which can be of the same or different designs - criteria varies for different stores. On top of that, if you have a flair for bargaining, you will be able to get a better deal. I must say, save your (bargaining) efforts if you really like the item. JUST BUY. lol. Though the prices aren't the most attractive I noticed, they're still mostly cheaper than in Singapore. 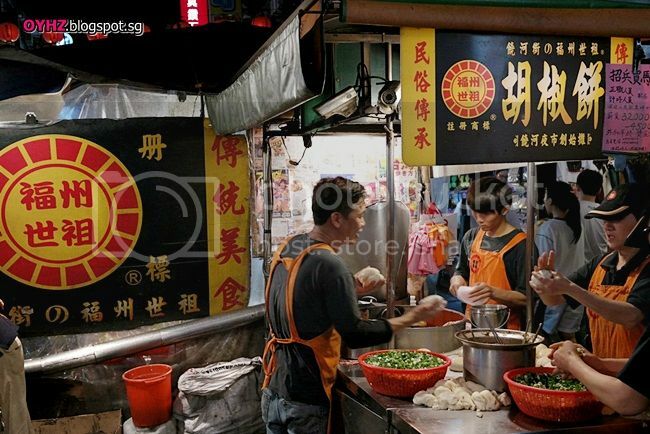 Raohe night market is a mere 10 mins walk from wufenpu. Use your GPS or screenshot the map before setting off! 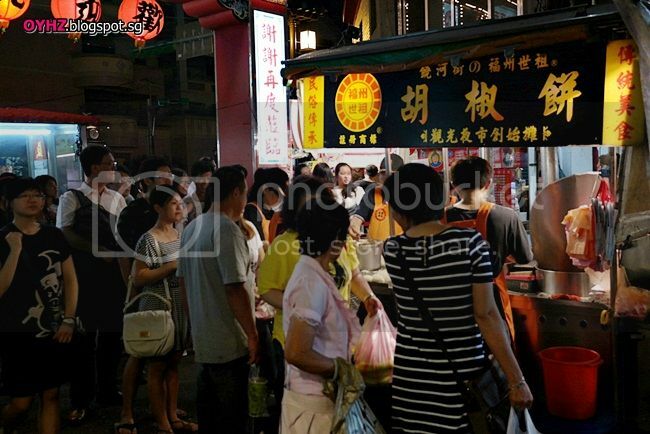 The Raohe Street Night Market is one of the oldest and most popular night markets in the Songshan District. 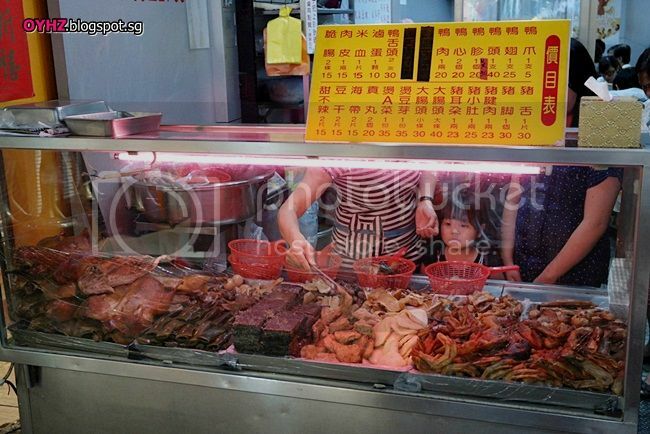 It is about 600 meters long, with Ciyou Temple is at one end of the market. 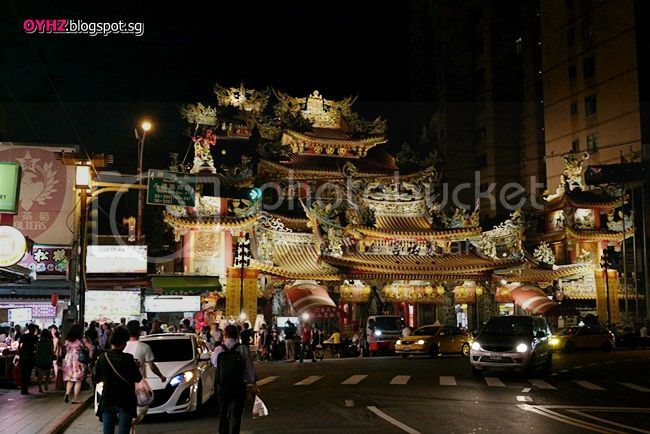 We followed our GPS from Wufenpu and found the temple (/night market) in no time! 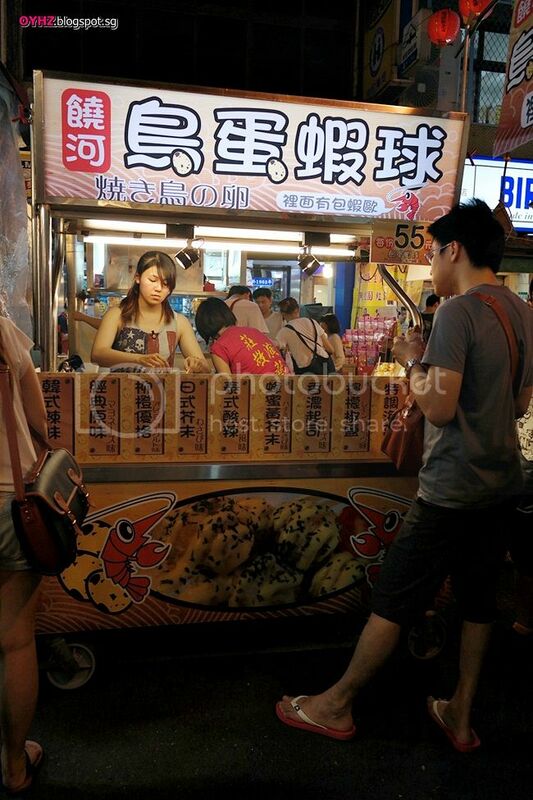 Smacked right at the entrance of the night market is the famous 胡椒餅 (black pepper biscuit)! 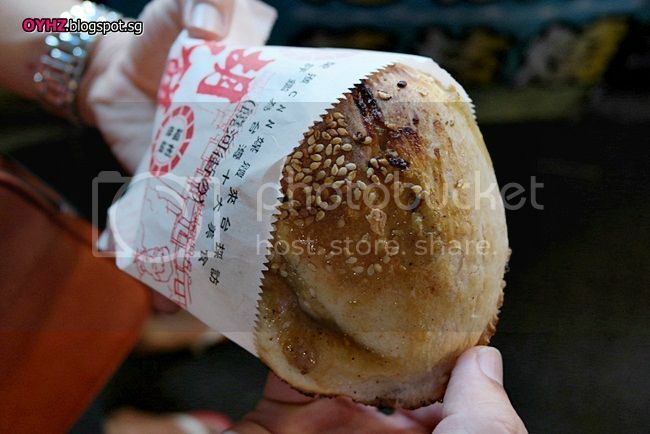 胡椒餅 (black pepper biscuit) is a Chinese snack composed of meat marinated with sugar, soy sauce, black pepper, and scallions encased in a large, flaky biscuit-like bread; this wrapping is not leavened with yeast. 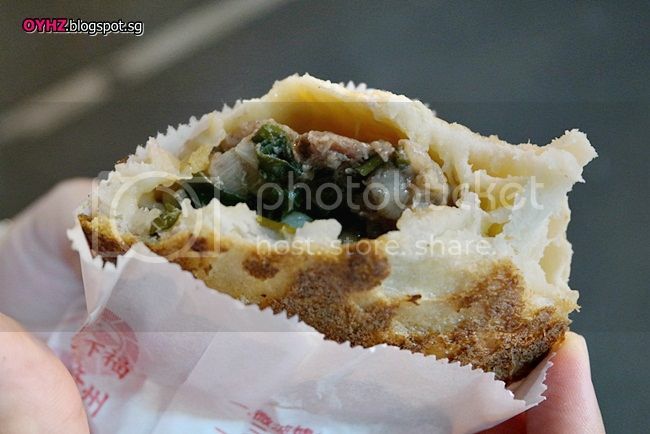 Thankfully the next street snack SAVED ma life! Just slightly further up from the pepper crispy bun stall, there is the 鸟蛋虾球 (quail egg with prawn) going at only TWD55 for 10 balls! Less than SGD2.50 for such a combination is quite something, cos in SG, anything with prawns, for instance, tako balls with prawn fillings will set you back at least $3 for merely 5 balls? Most important thing is, it is SUPER DELICIOUS. There are so many flavours to choose from, namely classic, japanese wasabi, thai sweet & sour, honey mustard, lemon pepper and so on! The best sellers are the classic and thai sweet & sour flavours. Anyone knows where to find this snack in Singapore? I almost psycho M to buy the tako ball machine/maker so that we can make it at home ourselves lol. Had some winter melon tea to dispel the "heatiness" from so much street food. Our next favourite would be 玉子焼! We had the choice of lobster fillings for this, and it was amazing! Queue was very long though, around 30 mins :( Be sure to grab something else to munch on while waiting! 3 Slinkys in a basket haha. 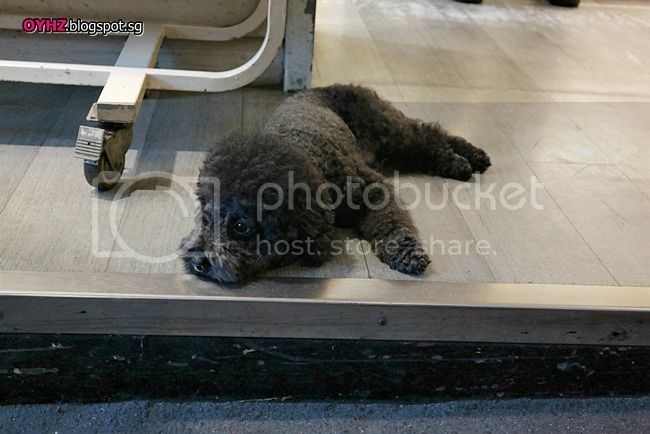 They were the stall owner's doggies and she kept them in the basket to prevent them from running around in the crowd while she's tending to her stall. After satisfying our tummies, we went to try our luck at the catching machines. M caught 3 lovely dolphins at one go! So li hai! And they were one of each of the colors available some more! Bought two pairs of sneakers from the night market for trekking the next morning. Here's one of them. Only TWD350 (SGD15)! 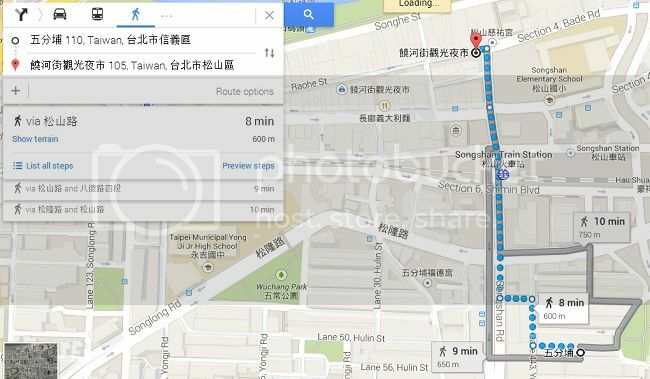 To go back to Ximending, simply walk to Songshan Railway Station and take a train to Taipei Main Station. From there, switch to the MRT to get to where you need, in our case, we took the MRT to Ximending which was just another stop away. Take note they should look like this, and not like the usual MRT trains! 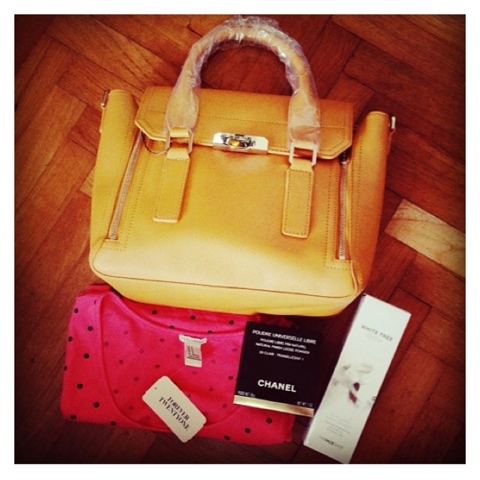 Currently there're only pictures of bags and clutches. 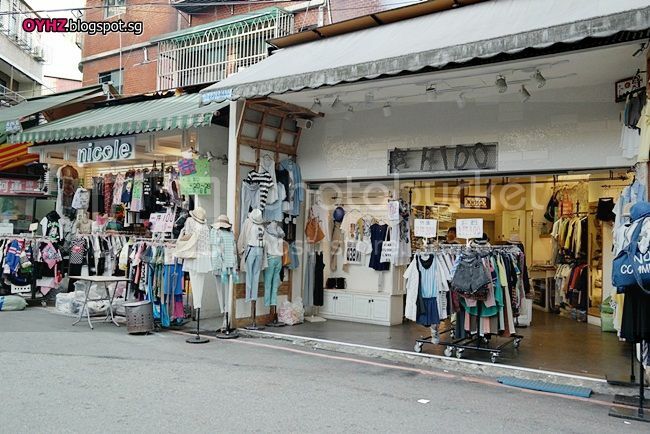 I'll update this space with clothings (all brand new, worn once, or pre-loved ^^) and other items soon! Meetup only for branded bags. Normal postage to be advised. All approx 11" x 6". 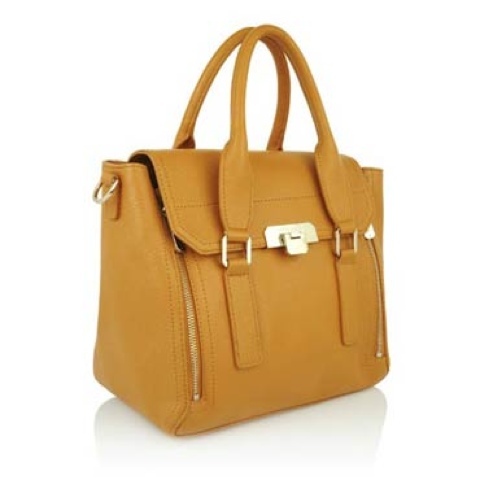 Comes with detachable faux leather strap, item 4 comes with detachable shoulder-drop gold chain. 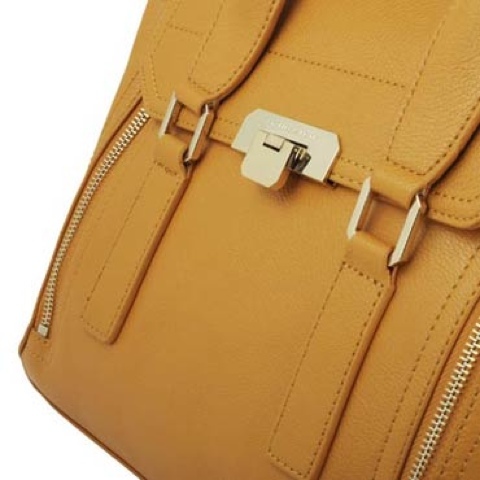 Wear & tear is the scuffing at the edges of the handles and sling straps. Can't be seen at all when carried. 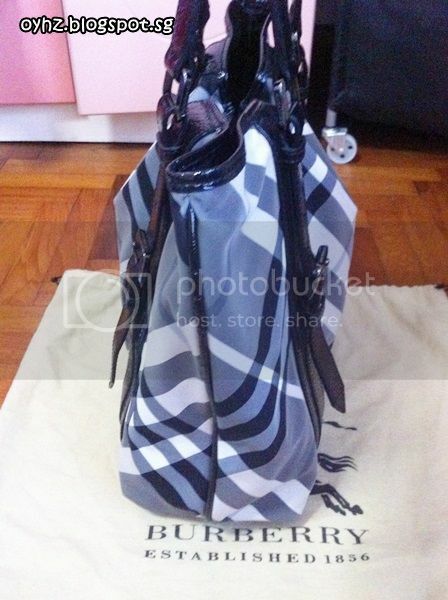 Exterior: Polyamide with crinkled patent calf leather trimmings, onyx tone hardware, 2 top handles, 5 protective metal feet at base and main closure secured with magnetic tab snaps. Interior: Polyamide lining with 1 roomy compartment, 1 zipper compartment, 2 multifunctional slip pockets and 1 stitched-on designer logo label. COD please. Meetups available at CBD/town or west area. 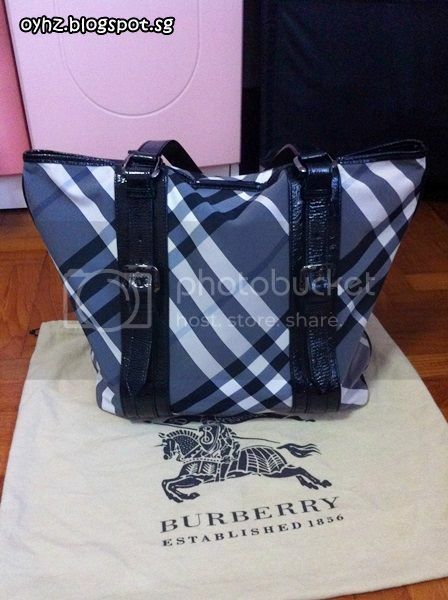 Or near a burberry boutique/2nd designer bag boutique should you need some assurance from the sales assistant. No returns/refunds/exchange after the meetup. Tubular top handles with rings. 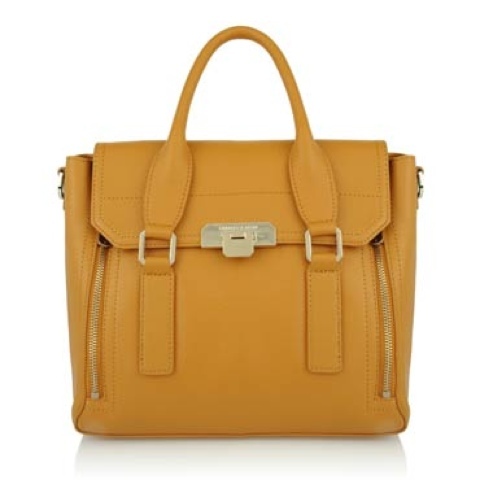 Removable, buckled shoulder strap; 10" drop. 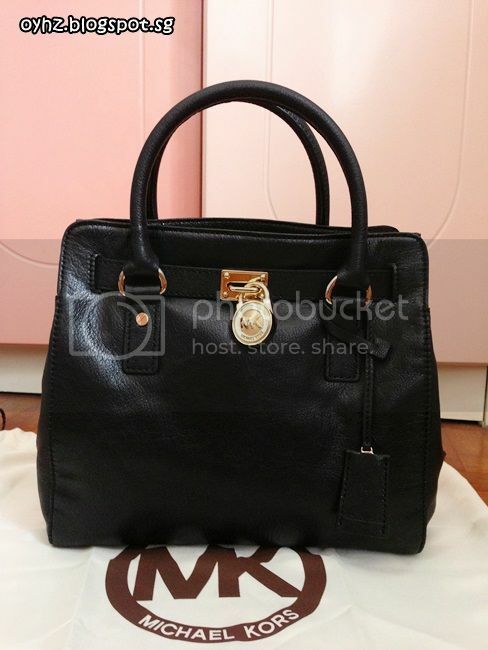 Cinched top with MK logo-engraved lock detail.